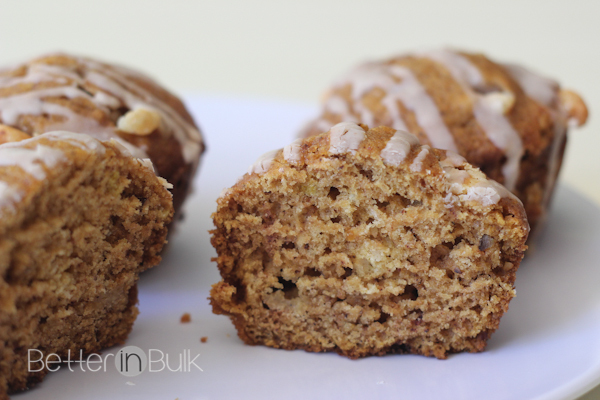 I was in the mood for pumpkin muffins this week (it’s that time of year, after all) and I decided to get a little creative with my standard pumpkin bread recipe and came up with this variation. Because I wasn’t sure how the muffins would turn out, I made some with no chips, some with semi-sweet chocolate chips, and some with white chocolate chips. Some were glazed with a simple spiced glaze and others were not. And the verdict was unanimous: the white chocolate chips with the glaze on top were the winners! KitKat brought the muffins to school and internship to share with friends and they agreed. We’re definitely making these muffins again. Spray muffin tin with non stick cooking spray. In a large bowl, mix together pumpkin, eggs, oil or applesauce (I used ¼ cup of each), butter, water, sugars and vanilla until well blended. In a separate bowl, mix together the flour, baking soda, salt, cinnamon, nutmeg, cloves, and ginger. Add ground nuts, if desired, and white chocolate chips and stir until combined. Pour batter into the muffin pan, filling each cup about ¾ full. Bake for 12-15 minutes or until toothpick inserted into the center comes out clean. Let muffins cool for a few minutes in the pan and then carefully remove to a cooling rack. Meanwhile, mix the glaze ingredients (I simply mixed it with a fork). When muffins are cooled completely, sprinkle the glaze over each muffin and let the glaze set for at least 30 minutes before eating. 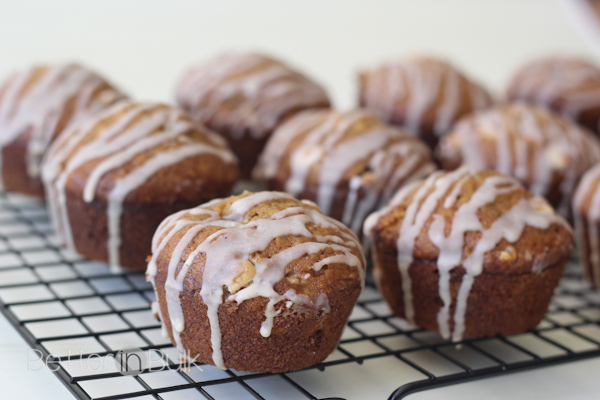 The “secret ingredient” in these muffins is definitely the white chocolate chips. Although most of the chocolate chips melted into the bread, they made a big difference in the taste. 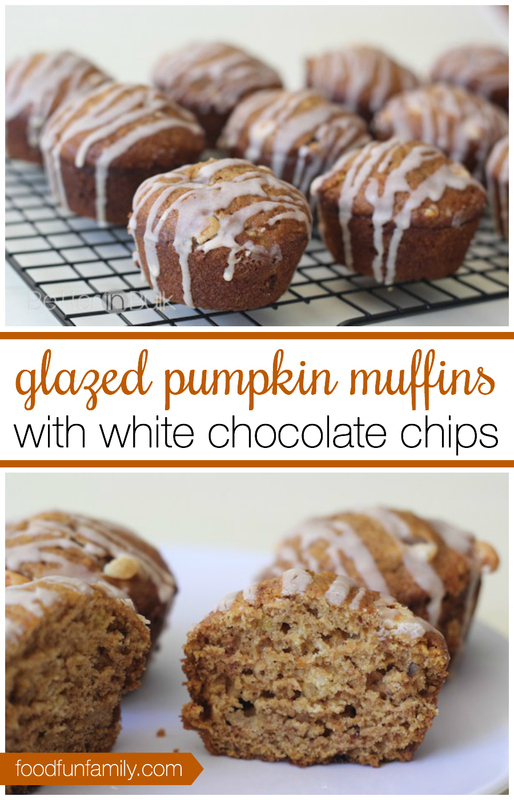 I’ll be adding white chocolate chips to my pumpkin bread from now on! Of course, the glaze was pretty popular as well…I didn’t complain about having to lick my fingers a few times while I was glazing the muffins! The nuts were a very subtle addition (none of the kids even knew they were there because I ground them quite fine in the blender before adding them to the batter. I’m just a fan of a hint of nuttiness in my breads. 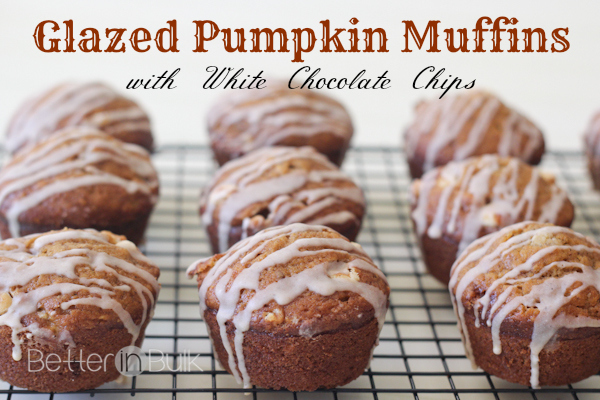 Have you been craving pumpkin recipes like me? I’m already planning my next pumpkin baking adventure (hoping for some energy to spend time in the kitchen tomorrow!). Come back for more recipes next week! I can’t find how many muffins this makes. Has anyone actually made this recipe? The only comments seem to be from people who said they should make them. I’m curious how many standard sized muffins can be made with this recipe and if anyone has suggestions for improvement. Thanks. This is the best Fall recipe! These look delicious and I can’t wait to try and make them for my family! These look amazing! I love Pumpkin. I will have to try this recipe the next time i have people over. Boy do these look delicious! I love just about anything pumpkin. I have had pumpkin bread with chocolate chips but not white. I will have give this recipe a try. OH SNAP! I need this in my face, STAT! Um, so do I. Really, I should know better than to write a recipe post like this when all of the muffins are gone. Totally craving more now.